An add-in is a supplemental program that adds custom commands or features to an application. The add-ins that are available via this site add such extra functionality to Microsoft Word. A macro is an action or a set of actions that can be used to automate tasks. All DocTools add-ins contain macros. Some DocTools add-ins may contain only a few macros whereas others contain hundreds of macros. All DocTools macros are created using Microsoft Visual Basic for Applications, also known as VBA. Figure 1. 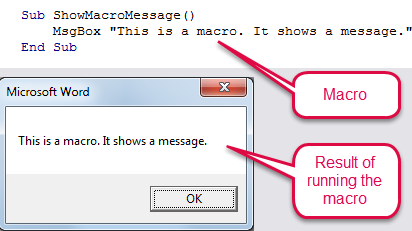 Example of macro and the result of running the macro. The functionality of an add-in or of a single macro can be made available to the user in different ways. For the best user experience, it should be easy for the user to find and access the functionality and tools. In Word 2007, Word 2010, Word 2013 and Word 2016, the functionality of an add-in can be made available to the user as tools in the ribbon or as buttons in the Quick Access Toolbar (QAT) or a combination of the two. Figure 2. Example of a custom tab in the ribbon with custom tools. In Word 2003 and earlier versions, the functionality of an add-in can be made available from a menu or a toolbar. If an add-in in .dot format (Word 2003 and earlier versions) is installed in Word 2007 or later version, the tools that have been added to menus or toolbars will appear on the Add-ins tab. If Word finds such tools, the Add-Ins tab will automatically appear. Figure 3. Add-ins tab with custom tools. In this example, the tools are included in add-ins that can be used in both Word 2003 and in Word 2007 and later versions. 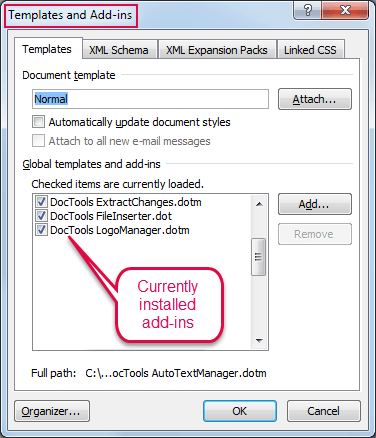 In Word, installed add-ins are listed in the Templates and Add-Ins dialog box. In Word 2007 and later versions, you can open the dialog box by clicking Document Template on the Developer tab. the Templates and Add-Ins dialog box. Figure 5. The Templates and Add-Ins dialog box. You may have several add-ins installed simultaneously. In Word 2003 and earlier versions, you can open the Templates and Add-Ins dialog box from the Tools menu.